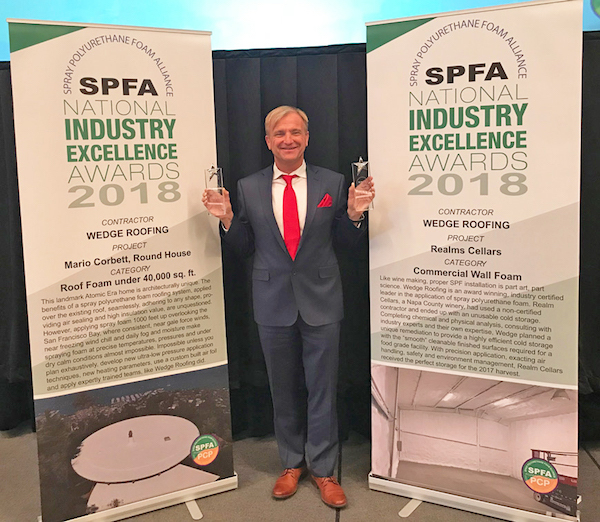 San Francisco Bay Area Certified Spray Foam Contractor, Wedge Roofing triumphed at the 2018 Spray Polyurethane Foam Alliance (SPFA) National Industry Excellence Awards by winning not one, but two of the prestigious trophies for their Marin County and Napa installations. In competition with the top spray foam contractors in the nation, Wedge won for both Best Commercial Spray Foam Insulation and, for the fourth consecutive year, the first-place award for Best Spray Foam Roof Nationwide. A leader in the spray foam industry, Wedge Roofing was the first in California to qualify as a Certified Spray Foam Roofing & Insulation Contractor, and is now the only Californian contractor to have won five Spray Foam Industry Awards. From a group of fifteen finalists, Wedge Roofing received the 2018 first-place award for Best Spray Foam Roof Nationwide under 40,000 square feet for their foam installation on an atomic-era home designed by famed mid-century modern architect, Mario Corbett in Marin County, CA. Wedge’s previous First Place Spray Foam Industry Awards honored their residential spray foam roof installation on a high-tech Eichler home in Marin County, a technically challenging foam roof installation on a manufacturing facility in Sonoma County, and a solar spray foam roof installation on a Vacaville church. For their spray foam insulation installation at Realms Winery in Napa, Wedge Roofing took home the Spray Foam Industry Excellence Runner-up Award in the crowded category of seventeen finalists competing for 2018’s Best Commercial Foam Wall Installation Award. The Spray Polyurethane Foam Alliance (SPFA), the educational and technical resource to the spray foam industry, announced the winners of the 13th Annual SPFA National Industry Excellence Awards at the 2018 Sprayfoam Expo in Mobile, Alabama on January 31st. “These awards recognize the year’s best-in-class industry projects,” said Kurt Riesenberg, executive director of the Spray Polyurethane Foam Alliance, “showcasing not only best practices in the application of materials, but also the exceptional performance and energy efficiency of Spray Polyurethane Foam in a variety of structures." "Thank you to the SPFA and the independent panel of judges for Wedge Roofing's fourth and fifth Spray Foam Excellence Awards! We also want to thank our foam manufacturers, Everest, for their support and guidance on these challenging spray foam projects. We achieved these prestigious Spray Foam Awards through the unwavering commitment of our General Manager, Gary Harvey, and the entire Wedge Spray Foam team whose exceptional contributions deliver superior spray foam installations. " We had a fire at our house and it burned the roof and the stucco on the side of the house. They did a great job and had it back to new in a timely manner. Thank you!"